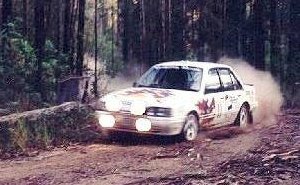 1995 Myself and navigator Ron Barkess competed in the NSW State Novice Rally Championships. We had a serious go from the first event, fighting for championship lead over the 7 event series. Ron and I finishing the series in 3rd outright. 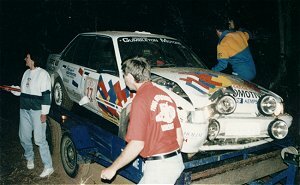 September '95 the Greg Crossingham Memorial Rally, Taree NSW. This event was a disaster. Ron and I being car 17 on the road, we were the first Grade5 (Novice) team. Every car on the road ahead of us had an "experience" on the left turn, a corner that was not called in the Road Book. 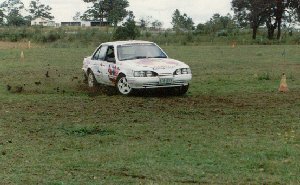 MotoKhana at Kempsey. 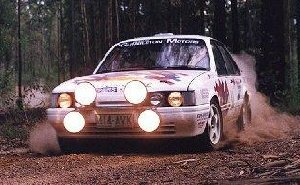 The setup of the car was not as good as I expected, I would have been better to put the original suspention in to give a better turn-in. But fun was had. 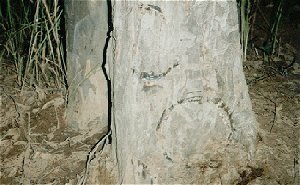 Tanban State Forest, Kempsey NSW. This was a staged photo shoot, my father took a series of photo's while I played with the setup. Looking at the attitude of the car you can tell I'm having a go, he was brave the corner speed I was getting was not leaving much room for error.